Ordinarily I use this blog to offer ideas that my readers in Tennessee (and beyond!) might embrace to help them cultivate resilience at home and in their communities. I have tried to emphasize in my writing that a positive vision must be held alongside all of the abysmal events unfolding around us. Even as I have been insistent on staring down the end of the world as we’ve known it, I have embraced at the same time, what could be, and have held in my mind and heart the threads of the new paradigm that so many of us are working to create. 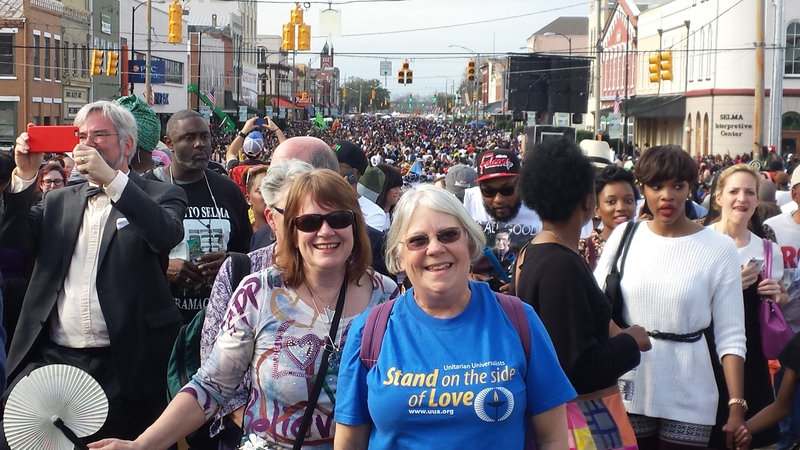 On March 8th, my best friend and I drove down to my hometown of Selma, Alabama to take part in the 50th anniversary celebration of the ‘Selma to Montgomery Civil Rights March’. The events of the weekend are still resounding deeply within me, and I find that whenever I try to talk with people about it, I get emotional and tear up. After a week of inner processing, I’ve come to the conclusion that what thousands of us glimpsed there was that new paradigm that I envision, and it has left me humbled and touched beyond mere words. This post isn’t about how to save money, or compost your waste or grow a cabbage or cut down on your energy needs. But it IS definitely relevant within the realm of transitioning. I hope my readers will be able to “see through my eyes” the positive transitions that I saw so clearly in Selma. The everyday world, that for many Americans, is filled with social injustice and inequality, racism, fear, oppression and poverty, became a better world for all of us that weekend. The reenactment that traced the steps of those 300 brave, brave souls that had crossed the Edmund Pettus bridge over the Alabama River back in 1965, held no sense of anger or despair, but was instead a celebration of peace and hope. Among the estimated 80,000 people that made the pilgrimage with us, we witnessed no drug use or drinking, heard no profanity nor saw any violence. As two white women in a sea of black, we felt completely safe and encompassed by a love that continues to hold me high almost 2 weeks later. The speakers and sermons were filled with encouragement and lessons of love. The former white’s-only church I had attended as a girl, now proudly held blacks and whites side-by-side in her pews that Sunday morning. Gone were the ‘White Only’ signs on drinking fountains and bathrooms and cafe doors. President Obama’s 40 minute long, self-written speech, was positive and poignant, and left echoes of continued calls to action in our ears and on our hearts. President and Mrs. Bush, the governor of Alabama the mayor of Selma, congressmen and more were moved to tears by his words. Martin Luther King had his dreams and I have mine. Even though the ‘Selma’ vision of equality and peace may differ slightly from the ‘Transition’ vision of localization, healthy and vibrant communities and alternative economies that I dream of, the possibilities are the same. After witnessing the transformations in my little southern hometown, I see now, first hand, that anything is possible. Carry on warriors. This has also been a transition; a long time coming and still going on, but progress continues. You left us see this thru the eyes of someone who was there, then and now, and thank you for sharing it. Sam Jones, This is your most powerful post ever! Thanks so much for this one and all its predecessors!